Toronto-based Oxford Properties has returned to the top of the annual Global Real Estate Sustainability Benchmark (GRESB) ranking in the North American diversified retail and office assets category. The real estate investment firm reached the top spot in the international assessment and ranking program five out of the last six years said Oxford’s head of office, Andrew McAllan. The only year it missed out was 2017. But Oxford, the real estate investment arm of the Ontario Municipal Employees Retirement System (OMERS), returned to top spot in the 2018 rankings, which are being released Thursday afternoon. “When we were not the best in our industry, we challenged ourselves to improve and we looked at every single component,” McAllan told RENX in an interview. He said Oxford’s worldwide team of 1,700 employees made a concerted effort to improve the sustainability of their portfolios, which include 50 million square feet of commercial space in Canada alone, including the MNP Tower in Vancouver and the EY Tower in Toronto. GRESB launched in 2009. The program assesses the sustainability of property investment organizations based on third-party review of their management, building certifications, stakeholder engagement and performance indicators, among other factors. Participants receive comparative data on where they stand against their peers and a roadmap to boost their performance. In 2018, GRESB assessed 903 real estate funds and property companies in 64 countries. The report covered 79,000 assets worth a total of about $4.5 trillion (all figures in Canadian dollars). Oxford began reporting to GRESB in 2011, McAllan said. However, Oxford pushed forward recognizing that competition would be healthy, McAllan said. Through this and other programs, sustainability reporting and ratings have come a long way over the past decade. To get back on top, Oxford cultivated a new system among its industrial properties to collect rainwater runoff from the roofs and divert it into the irrigation system. “That may not sound very original, but that wasn’t otherwise happening in industrial buildings,” he said. “We (also) have an initiative called Smart and Connected,” he said. During 2017, Oxford engaged with Rogers and RYCOM to implement the Cisco Smart Building platform across Oxford’s entire Canadian commercial and retail portfolio. The system interconnects building systems — heating, cooling, elevators, security, parking, and so on — and collects data on specific usage patterns. “We were able to take that data and use it to manage down our energy consumption,” McAllan said. The program reduced wasteful light usage and other key operations which weren’t necessary at certain times of the day or night, depending on occupancy. Oxford invested more than $20 million in its Canadian office buildings as part of the Smart and Connected program. McAllan said having a publicly available report card on sustainability is good for the planet as we face potentially dire consequences of climate change, but it’s also good for business. Tenants want to work in comfortable and well-considered buildings, and investors want to their money handled responsibly. In other GRESB categories, Toronto-based Bentall Kennedy retained its position as a global leader in sustainability, being ranked as the top firm in Canada and the second globally among diversified firms. In addition, MEPT/MEPT Edgemoor LP, the U.S. core open end fund strategy advised by Bentall Kennedy, continues to be ranked top three globally in its category (Global – Diversified). 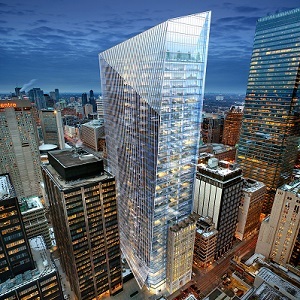 “Given the increased competition globally, we are extremely proud that the most recent GRESB results continue to demonstrate Bentall Kennedy’s worldwide leadership position in the area of sustainable investing in real estate,” said Gary Whitelaw, chief executive officer for Bentall Kennedy, in a prepared statement.